A study of school district spending patterns in 2016-17 has found it can be difficult to track equitable use of resources across schools because of the way budgeting is done and spending is reported. This discrepancy is of particular concern as schools are expected to report per-pupil spending at the school level in 2018-19 to comply with requirements under the Every Student Succeeds Act, according to Jess Gartner, the CEO of Allovue, the company that released the analysis. For instance, the study found that about 65 percent of all district dollars were spent at the school level, but only 48 percent of districts’ budgeting was done at that level, according to the research by Allovue, a company with a software platform used by school districts to create and plan budgets and monitor spending. The rest of the dollars are budgeted centrally from the district office. Although it is not yet required, submitting this data from 2016-17 as part of compliance with ESSA regulations would have produced “a really inaccurate depiction” of what schools are spending, she said. The study was the first full-year analysis done by Allovue, and it was based on data from districts ranging in size from 1,000 to 60,000 students in rural, suburban and urban settings around the country. The study is a representative sample of 1 percent of the total districts in the country, according to the company. How were these districts’ dollars spent in 2016-17? 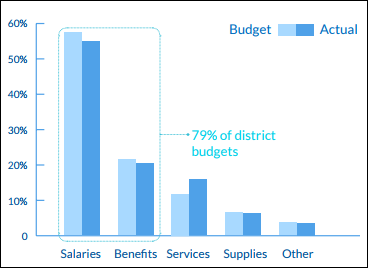 The following chart of general fund expenditures shows that districts spent 5 percent less for salaries and benefits than was budgeted, but spent 36 percent more for services than budgeted. The “services” category in school budgets studied is consistently overspent, Gartner said. In that bucket are third-party providers like consultants, audit services, strategy services and professional development. It also could be money spent on maintenance services, she said. Spending less on salaries and benefits is often an expected outcome, Gartner said, as vacancies aren’t yet filled and savings accrue. That saving becomes a buffer when money is needed for other purposes in a district. 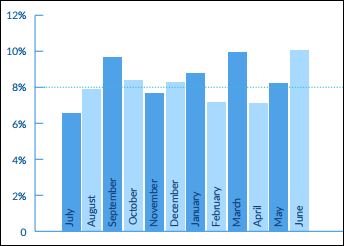 “This spending graph looks very different for the general fund than it would for grant funding, which is heavily backloaded at the end of the year,” in the March-June timeframe, said Gartner. The Nation Spends $649 Billion on K-12 But Does That Satisfy School Officials?